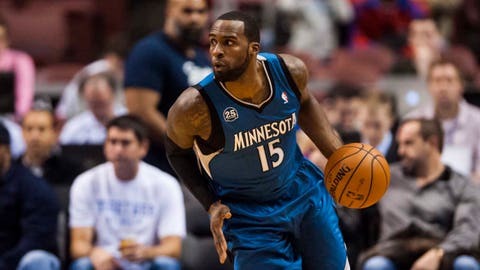 The Timberwolves' Shabazz Muhammad will join the Iowa Energy for a pair of games in Reno, Nev., on Tuesday and Thursday as part of the D-League Showcase. MINNEAPOLIS — Finally, Shabazz Muhammad will get some minutes. A decision made Friday became official Sunday as the Timberwolves assigned their top 2013 draft pick to the NBA Developmental League. Muhammad, picked 14th overall, will join the Iowa Energy for a pair of games in Reno, Nev., on Tuesday and Thursday as part of the D-League Showcase. Muhammad said Saturday he understood why he was being sent down and expressed excitement at the opportunity for more playing time. "I would rather go down and play right now, to be honest with you," Muhammad said. "Me watching is a good thing, too, but it feels like I haven’t played in a game in a while, so it’s something I’m excited to do." Buried in the rotation behind forwards Corey Brewer, Robbie Hummel, Luc Mbah a Moute and, presumably, Chase Budinger when he returns from a knee injury, Muhammad has appeared in 11 games, averaging 3.8 minutes and 1.1 points per contest. Minnesota coach Rick Adelman told reporters Saturday that Muhammad wouldn’t be with the Energy very long. "He needs to get on the floor," Adelman said. "That’s the biggest thing." Iowa serves the Timberwolves, Bulls, Nuggets, Pelicans and Wizards as a D-League affiliate and is 10-5 this season behind 23.5 points and 8.7 rebounds per game from Minnesota training camp signee Othyus Jeffers. The Energy travel to Fort Wayne, Ind., on Saturday, Jan. 11 before returning to Des Moines and hosting Rio Grande Valley on Jan. 12. Timberwolves president of basketball operations Flip Saunders plans to attend that game and will be in touch with Muhammad on a daily basis, Muhammad said. "He said he’s going to call me every night," said Muhammad, who averaged 17.9 points and 5.2 rebounds per game at UCLA last year. "It’s just something where I’m going to try to play as hard as I can and represent the Wolves."